Allston is a popular place for students to eat since the area is home to various styles of Asian cuisines. There are also many students who live in this neighborhood. Within Allston, there are many types of different Asian restaurants, including cafés that serve bubble teas and puff pastries. However, this is about the Korean restaurants in Allston and the different types of Korean food. These restaurants serve common Korean dishes such as kimchi pancake, topokki and bibimbap. Each restaurant has one dish that’s exclusive. Let’s explore. Probably the most famous restaurant, is located on Brighton Avenue — a busy street surrounded by other eateries. There’s always a long line of people waiting to get into Bonchon and the reason is obvious — their Korean fried chicken and wings are that good. My friends and other people keep saying that the spicy flavor tastes better, but for a foodie like me who can never eat spicy food, it is a pity. Located on Harvard Avenue, this restaurant has a big glass window that allows you to see through from the outside. Korean barbecue is the restaurant’s signature dish. I always go there for barbecue, as there are not many places in Allston that offer Korean barbecue. The price of the barbecue is a little high, and you can only have two kinds of meat on your table at a time. Other than that, the barbecue there is excellent, particularly the free appetizers they offer before the dishes come. I like the kimchi there. Buk Kyung is located on Brighton Avenue, and what’s special about this Korean restaurant is that they also serve Korean-style Chinese food, such as Jajangmyun (noodles topped with a black bean sauce) and Tangsuyook (sweet and sour crispy pork). These are both traditional Chinese dishes but also popular in Korea and developed into another style within Korea. Also, Jajangmyun and Tangsuyook are the best combos. The dishes are really large and the prices at Buk Kyung are reasonable. 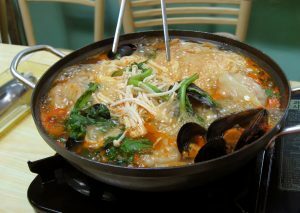 Located on Commonwealth Avenue, the special dish at Seoul Soulongtang is in their name: the Soulongtang. It’s a bowl of soup with a broth made of white ox bone served with brisket with noodles. There are also other beef broth soups available and these are super good during the winter. Beef soup is great for keeping you warm. These are Korean restaurants that I find special in the Allston area, and it is an area that is worth more investigation and eating.